Welcome to Market Profile Tutorial Series. 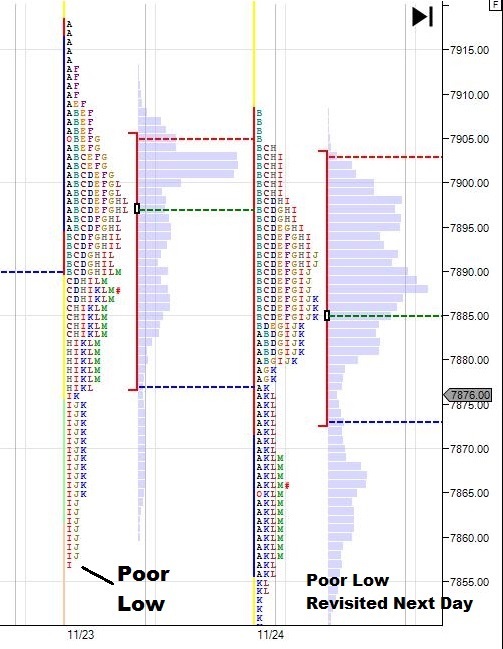 In the last tutorial we seen Failed Auction – Market Profile rules and this tutorial we will be discussing about What is Poor High and Poor Low Market Profile Structure and how to play it. Poor low and Poor High are market profile structure which generally indicates a market that is too long or too short and the shorter timeframe players in the market has low confidence about the current market direction and takes control of the market to move it in the opposite direction. This generally happens when the market is continuing its trend in one direction and the momentum of the trend starts loosing at the peaks which makes the shorter timeframe traders to think that market is too long or too short. Generally market trends ends at the peak with an excess or a tail. But if the exhaustion takes place due to lack of momentum at the high or lows with lack of excess then such auction is referred as poor low or poor high. such price zones are likely to be repaired/tested possibly the next day or within a week or two. 1)Poor High/Poor Low indicates a unfinished auction which in other words requires a price revisit to those zones to complete the auction. It can be identified at the high or low of the market profile zones with 2 or more TPO’s wider. More the TPO’s are wider higher the odds that such price zone will be revisited faster. 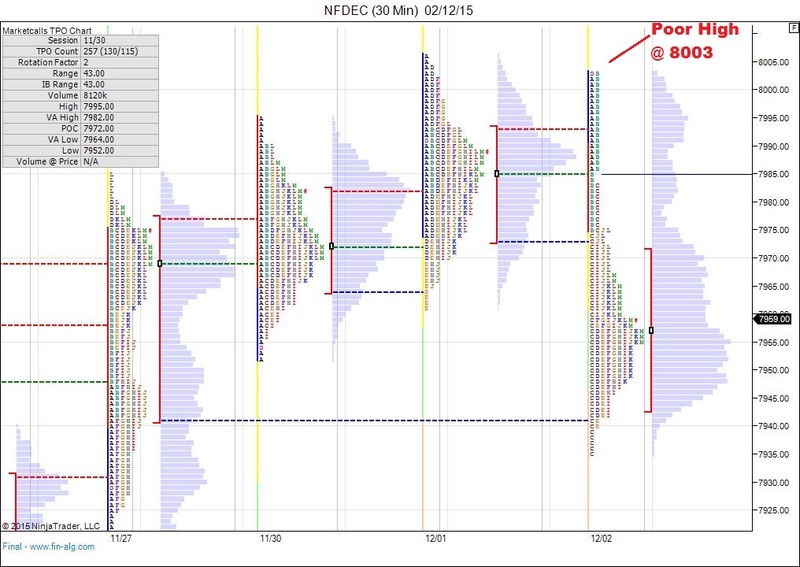 Above picture shows that Nifty Futures Daily Profile charts has two TPO’s at the highs i.e at 8003. Shortterm players are liquidating longs and getting into shorts as they belive market is too long. 2)Context-wise two days having the same high or same low is also treated as poor high/poor low and such zone requires repair. In classical technical analysis we call such pattern as double bottom or double tops and such zones are meant to be revisited which in classical technical analysis we call such zones as support/resistance zones. 3)Context-wise we also call a profile as poor high/poor low even if the profile is not wider a min of 2 TPO’s but only one TPO at the tails as shown below. Context wise one can identify from the trend with the combination of current profile whether the market is too long or too short. How to Play Poor High/Poor Low? One the poor high/poor low is formed on the profile charts the initial reaction is mostly against the current prevailing trend direction followed by repairing the poor high/poor low zone. If you are able to spot poor high/poor low intraday then you can play intraday around 2:30p.m towards the zone. If the zone is not repaired post 2:30pm intraday then the information needs to be carry forwarded for next day. Also if the poor high/poor low is forming on balancing or low volume days then there is high probability of faster repair of such zones. There is also a rare possibility of multiple poor low/poor high formation and back to back poor low and poor high formation such auction signals high probability of zone repair. In the next tutorial we will be discussing more in-depth about Excess- End of Auction Concepts. I was wondering if you have your market profile training all organized together. I wanted to send a link to my father to help him but there does not seem to be a beginning middle and end to your market profile information. I really like the way you present the material. Hi I just came across your name. Being from India it made interested to contact you. My name is Radha.